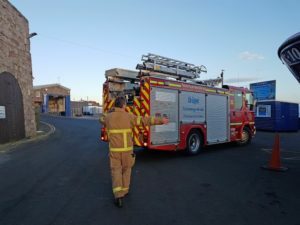 Photo shows the Wooler Fire Crew returning to station from Seahouses. Photo shows Wooler Fire Crew returning, RNLI station in background. 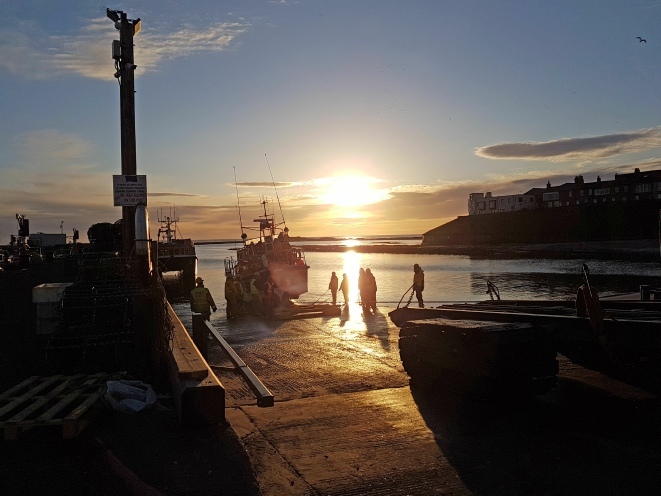 Seahouses RNLI were called out by the Coastguard at 3.50am on Sunday morning 24 March 2019, following a request from Northumberland Fire and Rescue Service to assist a fire crew to reach Holy Island. There was a chimney fire in what was reported as a terrace of houses. In such cases, the fire can quickly spread. Fire Crews from Berwick and Belford had just been able to cross the causeway, where the tide was flooding. Seahouses RNLI were requested to transport an additional Wooler fire crew. There is a fire engine on Holy Island, but there is no one on the island trained to use it. Local coastguards usually transport the fire crew to the fire station there in such circumstances. The RNLI have a protocol in place for the Berwick and Seahouses Lifeboat Crews to assist in transporting fire crews to Holy Island if required, and this procedure has been successfully practiced in joint training exercises. The Wooler crew and a senior fire officer were transported on this occasion. When the fire had been extinguished safely, the Wooler fire crew returned to Seahouses aboard the lifeboat to collect their vehicle. The Lifeboat then returned to station after what was their second call-out in 12 hours. A busy week end for the Seahouses Crew !